Trying to decide where to stay in Ivalo, Finland? And need things to do there? See why we recommend Aurora Village. Thanks to Aurora Village for hosting our stay! If you’re wanting a relaxing, nature filled vacation in Lapland Finland, away from all the hustle and bustle of tourism, you have to check out Aurora Village. It is an awesome place in Ivalo, Finland, that is perfect for a Northern Lights adventure. We headed here after our stop in Kemi Finland and Saariselka, Finland. Aurora Village has beautiful glass igloo cabins that make it a picture perfect place for your Aurora watching experience. 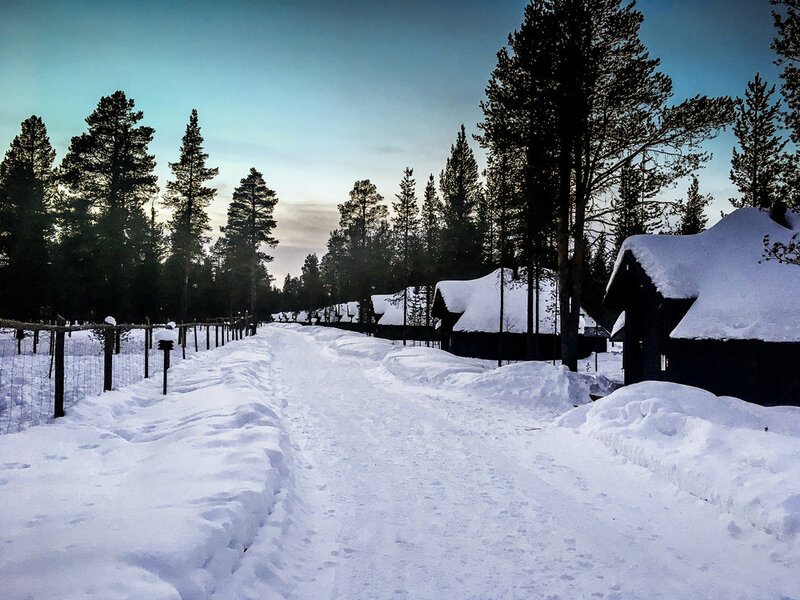 It feels like your own serene getaway, and is very quiet around the grounds, but still offers everything you would want during your beautiful Lapland adventure. Each cabin is an “Aurora Cabin” with a panoramic view, thanks to the glass windows on the “igloo” cabins. You can just lay on your cozy bed in the warm cabins, and enjoy the Northern Lights without all the light pollution. Each cabin is equipped with its own WiFi, twin or king sized beds (2 twins pushed together), and your own bathroom and shower. (We get asked this a lot) we found Aurora Village to have the best “re-heating” time for the showers as well. You get about 10 minutes of hot water, then just have to wait 15 minutes until the next person gets their 10 minutes. Other places we stayed were about 45 minutes. The best part about Aurora Village is they only have 25 cabins, so it doesn’t feel over crowded. You can even have up to 4 people in a room, so it’s great for families. We were welcomed with (non-alcoholic) champagne and water bottles on our bed. And had a little coffee/tea bar to enjoy while we were in our room as well. Aurora Village also had the best complimentary toiletries in the bathroom as well. I was excited to see the hand cream after our couple weeks in the cold weather. Aurora Village also has something very unique for their property...they own their own reindeer, and they are in the middle of all the cabins! It’s so cool to walk out and see all of them lounging around and hanging out. Even better? You can go inside the pen, and feed them in the mornings! (For a small fee). It was one of the coolest things we did in Finland. Ice Karting! It’s exactly how it sounds. You get in a small “kart” and race around an ice track. They go pretty fast, and slip and slide around the corners. It was always safe when we “crashed” cause you just head into a snow bank...and they can help you pull it back, or you hop out and pull it back, then start driving again. We had such a blast flying around on those little cars. It was only 15 minutes of driving, but it was enough time to really enjoy it. B wouldn’t stop talking about it, so you know he loved it. The next night we went on their Aurora Tour by Snowmobile. We got to drive our own snowmobile around and follow the guide. Unfortunately, it was super cloudy, so we didn’t really get to hunt for the lights, but it did turn into an awesome snowmobiling trip. We had a blast, and the guide took us on a great ride. We were the only ones on the tour, so he went at a good speed for us to really enjoy it. We stopped in a tee-pee and had hot berry juice and cookies before heading back. Our last day there, we were met after breakfast with this awesome house sleigh ride. The guide took us around the property and into the woods a bit, and it was a nice relaxing ride. If the horse ever got tired, he stopped and rested, then headed back. We just followed the horses pace, and enjoyed the scenery. You can see all of their activities here. We were able to relax and really enjoy the nature at Aurora Village. If you’re looking for a place to unwind and stay a bit away from the craziness of tourism, this is your spot! -Aurora Village is a good distance from the town, so we suggest getting the meal package and expect to stay on the grounds. (Unless you have a car of course). -The WiFi in the room was actually the best WiFi we came across in Finland, as many others weren’t up and running very often. So if you have work to get done, you should be set. -The less cabins mean the tours or excursions you do won’t be overcrowded. So we recommend booking your excursions here where you’ll be able to have a little more one on one time. -We took buses for most of our Finland trip, but we did hop in a taxi to get us to the village. Again, it’s a bit of a hike to get to, so if you aren’t renting a car, and you have luggage, probably call for a taxi.